Palliative care, which may also be referred to as palliative medicine or supportive care, is specialized medical care for individuals with chronic or advanced illness. Palliative medicine provides expert pain and symptom management and enhances quality of life, and is appropriate at any age and any stage of the illness, even during curative treatments. 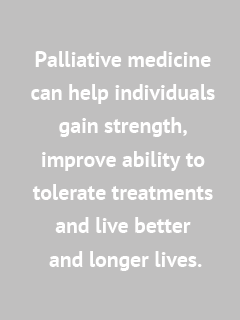 In fact, palliative medicine can help individuals gain strength, better tolerate treatments and live better and longer lives. Your JourneyCare Palliative Care professional visits you in your home, wherever that may be: a private residence, a senior living community, assisted living or long-term care community. We also provide care at partnering hospitals and outpatient clinics. JourneyCare’s Palliative Care Team includes board-certified doctors and advanced practice nurses, along with licensed clinical social workers and other professionals with specialized training and expertise in palliative care. Our palliative team works in partnership with your doctors to provide an extra layer of support, focusing on identifying sources of pain and discomfort and providing recommendations for treatment options that can offer relief. In addition to relieving pain and symptoms, the palliative team helps you and your family understand the illness and available care options, while also helping to clarify goals of care and choose treatment that aligns with your goals. Some of these illnesses include Cancer, Congestive Heart Failure (CHF), Lung Disease, Rheumatoid Arthritis, Multiple Sclerosis (MS), Kidney Disease, Stroke, ALS, Parkinson’s Disease, Alzheimer’s and Dementia. Most insurance plans cover all or part of the palliative care treatment program you receive. Palliative consultations are billed under Medicare Part B, similar to a doctor’s visit. Standard co-pays and deductibles may apply.